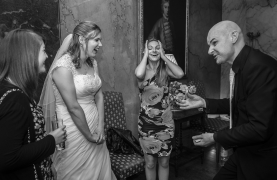 David Fox frequently performs his special brand of magic at many of the most prestigious wedding venues in Leicester. A party is an ideal time for magic. David can entertain your guests in the comfort of your home or at any venue in Leicester. Magic will add flair to any corporate event. David frequently impresses at functions throughout Leicestershire. Seeking something unique, magical and incredible for you next important Leicester event? For world class entertainment at your special event in Leicester, contact David Fox today. Your wedding, party or corporate event will be a truly memorable experience for everyone present. Watch as David Fox mesmerises, mystifies and enchants everyone with his spell-binding magic. David is a proud entertainment supplier for the Quorn Country Hotel and Catthorpe Manor. He recently performed at the British Gas annual awards ceremony at the King Power Stadium: the home of Leicester City FC.